Alhaji Abdulrahman Mohammed, is a former National Security Organisation, NSO (Now DSS) Chief and close ally of ex-military leaders: late Generals Shehu Musa Yar’Adua, Sani Abacha and former military President, General Ibrahim Babangida. In this interview, he reveals deadly plots going on within the inner circle of President Buhari’s government, which will ultimately lead a former Secretary to the Government of the Federation, Babagana Gingibe to succeed the President after the 2019 polls, which he claims will end inconclusive. Yes and what happened that you couldn’t stop the annulment of a transition that was almost coming to an end at that time? Was it something that was beyond your powers? Now you know NLC has a lot of role to play in supporting a government? Pascal Bafyau played the game for Babangida at that time just like Oshiomhole did. Pascal Bafyau was a pro-Babangida man. So Babangida tried to pay him back by insisting that he should be the presidential running mate of Abiola. So it was because Abiola refused to announce Pascal Bafyau as his running mate and chose Babagana Kingibe instead that caused the annulment of June 12. Abiola had been told by Babangida in my presence that if he did not take Pascal Bafyau…anyway we were following what was happening in Jos during the SDP primary on our satellite programme. We knew every move that was taken, everything that happened there because my boss, Shehu Musa Yar’Adua was in SDP. You know he was my former boss. I worked with Yar’Adua as Security Detail in charge of International Security Surveillance. You know our predicament in Nigeria today is because they think that Nigeria is one local government that anybody can be president and manipulate the way you like. We are in the world. At the time America and Israel said they were going to deal with Buhari on certain issues that were happening to Christians in Nigeria I warned Buhari. I was on Facebook and Whatsapp. I warned some of the service chiefs that I know that the American and Israeli consortium will ensure they break Buhari’s government until Buhari will leave the place. It was an agenda already promised that just happened like that because Babangida had already promised Abiola that if you don’t pick Bafyau…Babangida was not in our team. We have a record of everybody. You know that was where my section is. I was a security chief and now having served the defunct NSO as a Director in terms of security surveillance, in terms of interrogation I have to be involved in logistics. I made sure I had to advise them on logistics to make sure that there was no black sheep in the entire arrangement and it was necessary for me to be able to say what is right and what is wrong. It was necessary for us to have information on every human being that was a player in the national scene at that time. The Interim National Government. It was Shonekan who was president. Kuforiji Olubi was Minister for Interior, actually Minister for Commerce and National Economy just like Okonjo Iweala was Minister in charge of the economy even though she was Minister for Finance. In our own time it was Kuforiji that I called and I told her to get ready to make sure that the Interim National Government survived. That is why we decided with Aliyu Jem’a, the Secretary to the Government to have a transition committee which was headed by this Jurist, Mamman Nasir from Katsina. He headed the Transition Implementation Committee. Then my foster father, Abdulrahman Okene headed the committee in charge of Devolution of Powers between Federal, States and Local Government. You remember that? So when we did all that and gave them their letters of appointment Aliyu Mohammed reported back to Babangida that we had already executed the issue and Kuforiji Olubi was doing our bidding. But when within the military hierarchy it was discovered that there were people who feel they had a dream to be president of Nigeria, Danjuma and Abacha were the only ones that were left out because Obasanjo, Babangida, all these people were in the same group and the same thing. I served all of them as the NSO component of the military regime. So, internally they had a plan that Abacha should become Head of State. We had no control over that plan because you can see that the coup that brought in Abacha was a quiet one, not even one that qualified to be called a coup. Abacha told me to keep faith with him. Okay, let me break it down for you. You remember that Ashwey became the Managing Director of Continental Merchant Bank at that time; the bank that was opposite Leventis? Because it was a strategic location Abacha had shown intention to purchase the building. But Ashwey sold it to Salihijo Ahmad of PTF because they wanted to use it for Buhari for President Campaign Organisation. That is why Abacha told me to move against them. That is why we interviewed Salihijo. We called him in and investigated PTF. After leaving our place for debriefing, Salihijo went to his office and said he was going home because he had headache and the wife told him to go to the hospital and see the doctor. He was waiting to see the doctor when he slumped and died. Posterity will judge that and Nigerians will react to it. There is excitement of course because Abiola was badly treated. And Abiola talked to me. You know I was the intermediary between Abiola and Aliyu Mohammed, Wazirin Jema’a, the Secretary to the Government and Wazirin Jema’a, the Secretary to the Government was the intermediary between Abiola and Babangida. What I deliver to Aliyu is what he discusses with Babangida on Abiola because we didn’t want a direct link that the media will look into concerning the relationship and communication between IBB my boss and Abiola. You understand. I hope you are getting it now? So the issue is very simple. We did not expect Babagana Kingibe to be running mate to Abiola because…and of course he betrayed him. Have you read some of the things that happened between the June 12 annulment and now from Babagana Kingibe? Because he had refused Abacha’s proposal to be president. Nobody refuses Abacha. Even when Buhari was in power nobody refuses him. Hakimi Sokoto died because Buhari refused to allow him have access to medical attention when Buhari was in power. I am talking of Wazirin Sokoto then. That was why when Buhari was in detention and his mother got sick and died they refused to allow him go. But when the mother died they released him. Now what are your thoughts about this recognition given to Abiola by Buhari? It was ultimately going to happen, my brother. All the presidents that have passed… Goodluck Jonathan asked for my opinion on this when he was president. I told him to call Abiola’s son and discuss with him. Then he called Kola Abiola. You know I was on retirement and was not a member of Goodluck Jonathan’s government. Was it not your paper that treated about five pages of what happened with ACF and Northern Traditional Leaders on my exposition on paradigm shift that we profiled to make sure that Goodluck Jonathan becomes president? Didn’t you interview me at that time? The issue is very simple. If Buhari doesn’t play ball in his own government he shouldn’t expect anybody to play ball in their own government. Now, the June 12 issue. There are legal and constitutional procedures, which he has flouted. My old colleague because he is much older than me, himself, Pius Okigbo, Rotimi Williams, all of them we were together. I was the youngest on the Committee of Concerned Citizens. You have the list of the committee members with Yadudu, Hamza Zayyad. Justice Bello, former Chief Justice was once the Chairman, Rotimi Williams, Akintola Williams were all in the 32-member team that they said was going to save Nigeria. I was the youngest of them all. After this interview I will search my IT library what this man, that legal luminary, Ben Nwabueze who was also a member of the Concerned Citizens Committee said. Nwabueze gave a treatise on Buhari’s mistake. Read it and incorporate it into this interview if you want to because there are procedures on all these issues. Look the first problem that Buhari has in dealing with the issue of June 12 is that when Buhari came to power he was excited. He rolled out decrees to make sure that even Journalists that even reported the truth was going to face death sentence. Do you remember that? In that decree there were some that had to do with making sure that all actions taken by his military regime cannot be undone. Buhari is the one who promulgated that decree and I had the privilege of seeing Idiagbon to tell him to be careful and that what Buhari has done was going to catch up with him. By doing the wrong thing for the right reason. You can do the right thing with the wrong reason. So Babagana Kingibe’s style of betrayal is this; only intellectual and intelligent people can see it because it cannot fly. You think the recognition of changing Democracy Day to June 12 is going to show? There is nothing in the world that says he has powers over Decrees and constitutions and out of excitement we must all lose our heads. Why I am not going to say more is that some things are likely to happen in Nigeria in due course and I don’t want anybody to say that I knew before hand that it was going to happen. So if you are really my brother let’s leave that aside I cannot tell you more. How would the advice by Babagana Kingibe cause post election violence? It is not a masterstroke anything. He did it for himself. He did it to increase his popularity because his popularity and acceptance have waned. It has gone down terribly. We measured it. America measured it. My Israeli friends measured it and told me about it. So he is trying to beef up his acceptance. Babagana Kingibe is very intelligent. In all the forces in Nigeria there are not up to three that are the best hands in security. 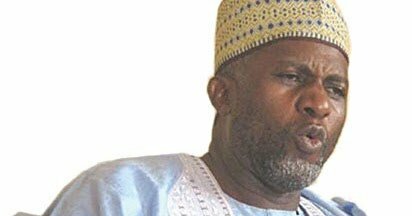 Babagana Kingibe was an operative in the NIA. No, what he gave to Abiola is just fine but it is not done. There are procedures to be maintained please. You don’t just do things as if it is akara (beans cake) that they are frying on the way. The constitution is our guide. That is why there is no anarchy on our streets. Buhari must obey that constitution because he is an employee of the taxpayers. He is not a president for life. He is not our God. He is a human being. So the positioning and grandstanding of his supporters are meant to destroy him. So, southwest will not vote for Buhari in 2019. And some people have told them Buhari can never be the kind of person in the world that will make it possible for an Igbo presidency in 2023. I am checking all the documents everyday even though I am in retirement so that the day anybody thinks he can tell me nonsense if my spirituality is not enough to destroy them I have enough documents to make sure they are caught off guard. Buhari is deceiving them. Please understand that. And let me say this before you call off this interview; you see anything you call anti corruption actually started from Abacha. During Abacha PTF was our first call. Immediately Buhari refused to accede to that document that Abacha asked me to take to him we broke down PTF. We wanted PTF to have eastern, south-south, south-west and northern desks because a lot of people started complaining that the PTF was mismanaged. That is why the documents I raised at that time, Buhari’s PTF and the great betrayal that happened under Buhari was put on Facebook recently. I have it. The issue is this. After finishing with PTF our next call was Nigerian Railways. Nigerian Railways was a strong money guzzler. At that time the Yeriman Zazzau, Muniru Ja’afaru was the Managing Director of the Nigerian Railways and General Gumel was the Chairman. So he came to me and told me about the $30million bribe money that the Chinese people gave railway officials. So Muniru Ja’afaru came to me and reported to me. So Abacha said we should debrief Gumel. Unknown to him, Muniru had already told me everything about it. When he finished then I told him what I knew. Then he broke down crying. He went home, had a heart failure and died. So Buhari is not doing a new thing. Let those who ve ears, hear this indept disclosure. ‘THE 2019 GENERAL ELECTION WILL END INCONCLUSIVELY !.So declared the fmr Chief Security Spy of past Nigeria Govts. Alhaji Mohammed who served under the Military Govts.His disclosure confirmd the Statement by Elder States man Alhaji Balarebe Musa, That the National Honour given to Alhaji Kingibe PMB was for political reasons & permuntation ahead of already Scripted plan by the Presidency inner Cacus & Cabals, Based on the political realities in the Country abt 2019 General Elections.An overt readiness for President Trump of America & the Isreali Prime Minister comments about the continued pland Killings of mainly Christians by the Fulani Jihadists in the sellected States accross Nigeria.Wt the Presidency & the Nations Security Commands, lookn unconcerned.As if it was Chickens that were being slaughterd by the days & nights in defiance of the Security agencies, Stationed wtin the Localities this genocide happens on daily basis. I urge patriots & all Nigerians of gd will,irrespective of ethnicity,hate, religion, acts of Vindictiveness, Parochialism & other Nundane pursuits to pray fervently to God to touch the minds of those who may ve seen the hand writings on the Wall ahead of 2019 General Elections. But may ve decided to plan Evil against the Aspirations & collective interests of Nigerians.To Beware of Ides of History.Also bear in mind that no individuals has monoply of Violence.Above all, bullets do nt discriminate it’s Targets once Fired into the Mkt square.Nigeri Call Obey !